One thing to note about this level, if you're over the water watch out for the Leviathans patrolling below as it will eat you if you're close by. If you do get eaten simply attack the Leviathan's dangly Uvula and you'll be spat out near the start of the level. Go over the water at the bottom of the tiled bridge and follow the chain of jewels to a Water Gate. The teleporter here will take you back out, so don't go stepping into it right now. Walk to the right and cross the wooden bridge. You'll come to a formation of islands in a triangle with bridges connecting them, and running around them is a Hob 'n' Yaro carrying your Present. You'll need a long range attack to hit him or a fast Skylander to chase him down for a Napoleon Hat. Watch out for the Squiddlers in the centre and the Blastaneers around the edges. Also here is a Treasure Chest to the north. Teleport back out from that initial island. Anyway, walk down the path and you'll see the little red devil-like Hob 'n' Yaro steal the first of the four statues. You're going to have to chase it down to get that statue. First get rid of the Squidface Brute blocking your way before crossing another bridge. The little thief will trap himself between some barrels and a fence so it should be straightforward to catch. Smash through that fence, perhaps kill the Squiddler on the platform, and approach an upturned boat. Out of that boat will appear a string of Nauteloids for you to wipe out. Next to the next wooden bridge is a boat with a couple of Squiddlers aboard, you can smash this to destroy them both. As the name may have suggested to you, there are some turtles on this island. It's another simple block puzzle, you've got to push them into a line to use as a bridge. First push the right-hand one forwards, then the one to your left to the left. Push the middle one forwards now and then circle around it to push it to the left. Now push the remaining two turtles into position next to it and move on over them. Another one of those thieves will appear and take a key, this one will be slightly tricker to chase down but if you don't have any range attacks and aren't particularly fast you can trap him by pushing a turtle in the far right corner so that it blocks a bridge. Then just circle around and he'll get trapped allowing for easy grabbings. There's also a Story Scroll on the right. After going through the locked gate you'll need to push a turtle out from in-between a couple of Squiddlers, push it back once you're on the other side. The second statue is right here too. Drop off the side next to it and smash up all the scenery, to the north is a teleporter from under the little pirate hut. This will teleport you up to the Squiddlers you just passed by and, provided you pushed the turtle back into position, a Treasure Chest. Carry on leftwards, there's more enemies hiding in the boats and a Brute that'll approach. Walk up a small plank just beyond a couple of raised wooden platforms to find Zap's "Love for the Sea" Soul Gem, and a couple of Squiddlers on a boat. Cross over the bridge to the next island and, aside from another Brute, another thieving Hob 'n' Yaro will appear and run after the statue to the left. To trap this one there's a turtle on the island where the statue was situated, it again blocks a bridge. Go around and hunt it down. On the bigger island with a raised platform with a couple of Squiddlers on, go around the back of the large building and you'll find a Treasure Chest. Go up the steps to the top of the building where Gurglefin is waiting next to a turret. He says to aim for the masts but you're going to need to fire on the rest of the ship as well. This also triggers the appearance of the Legendary Treasure. To get it simply go over some water and get eaten by a Leviathan. And make your way back through the level to where you just were. At the right side of the island is a slope up to the smashed up ship where you can find the final of the four statues. Kill the Blastaneer on the other side of it. Make your way along the bridges to the shrine killing the few final enemies in your way and place the four statues in it by standing on the glowing circle. Approach the Eternal Water Source when you're ready to leave. And it's time for your first boss fight. First Kaos will send out his Evil Water Dragon, this is essentially a clone of Zap and has the same sort of abilities. His attack pattern consists of a short dash forwards followed by three electric blasts fired at your Skylander. He'll then celebrate and start the cycle over. You have a chance to melee him when he pauses and can long range attack at any point. When his life bar (at the top of the screen) empties he'll drop some food and some experience. The next stage of the fight involves a spell from Kaos, this will cause the floor to flood and a series of small sharks to rush by. Stay out of their way, you can't actually attack them, otherwise you'll get damaged. Getting close to one will trigger a brief slow-mo sequence where if you manage to move out of the way you'll be given a small amount of health. Not particularly worth it as a method to heal up as the damage done when hit is much larger but it's a nice accidental reward. Survive that and Kaos will send out his second minion, an Evil Amphibious Gillman (aka Gill Grunt). He will stand still and fire a triple blast of harpoons out at once, one direct ahead, and one to each side. If you move to the side as he first you'll generally be in-between the harpoons. He does this three times before pausing. If you get close to him as he's about to fire he'll zoom off a short distance with his water jet and start firing. Once he's dead you're onto the second part of the spell. Again dodge the sharks, you should be able to stay where you are and move a little side to side to avoid them all fairly easily. Third minion is an Evil Ice Yeti, the equivalent of Slam Bam. His attacks consist of moving towards you and firing an ice beam along the ground, after a distance this stops and turns into a large ice block that doesn't really do anything, aside from blocking your way towards him. 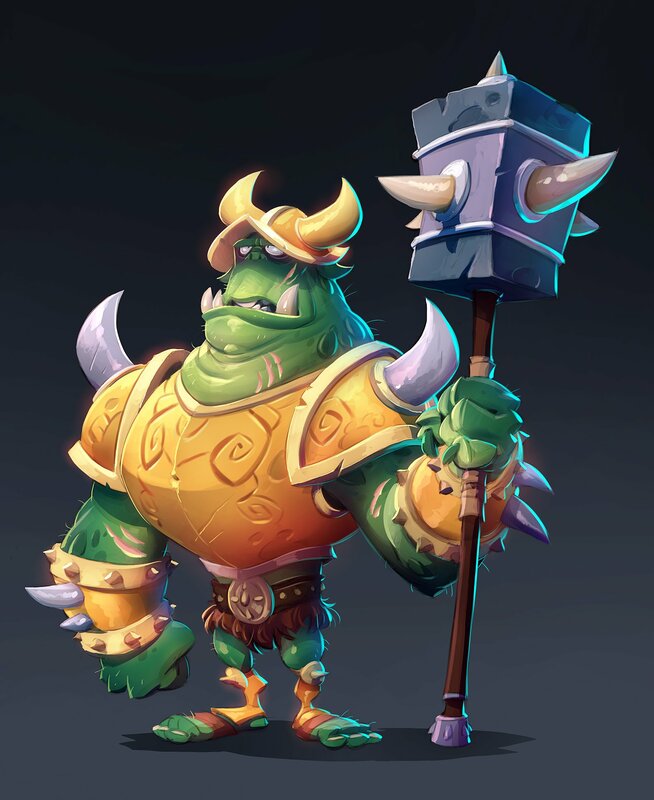 Once either three of those are cast or you walk into one he'll start swinging his arms about three times punching the air, or your Skylander if you're close by. If you're melee, attack during the ice phase and then move away, because you're close it'll only cast one ice block before starting to punch. If you're long range, attack him at any point by standing a fair distance away from him, he should take a little while to get to you so if he gets close just run off again. And now for all three of the minions at once. Luckily they have a much reduced health pool each. "Zap" the Evil Water Dragon is probably the most dangerous at this point as he's a fast mover and first quick blasts of electricity. So take him down first. Then we go for Slam Bam who you should have been keeping away from. And finally focus on "Gill Grunt" the Evil Amphibious Gillman, he has a long range attack but doesn't move so you can always be sure of where he is (provided you don't make him move that is). All through this Kaos will be sending yet more sharks out, it'll build up to be quite hectic but then after a while it'll just turn into an infinite stream of them to the left and right sides. Once you've defeated all three minions you win the Eternal Water Source to finish the level. You'll be told to investigate a newly opened section of the beach. Before you go down there you can also now find that a new totem with a Fire section has appeared in the same place as the previous one this time giving even more gems. There's also a larger gem inside the cage where Gurglefin was trapped, the lock puzzle is a little more complicated this time. A solution is: Left, Left, Left, Right, Left, Left, Right, Right, Right, Left, Right, Right. While you're here grab the Oil Can and then approach the gate that you saw open to the right. The second Winged Sapphire should be right there. Ignore the little things diving into the sand and use the Oil Can on the little robot sitting next to the wall. This will open up a cave in which you can find the third Winged Sapphire. Outside again there's another larger robot further along, oil him too to get him talking. The Clam-Tron 4000 wants you to gather five clams for him, they are the little red things running about. To collect them simply run into them, they no longer dive into the sand and don't move very fast. There's a fourth Winged Sapphire to get now as well, go over the water to the north-east and you'll find a tiny stone platform with a bounce pad on it. Follow the pads along across a series of high-up floating platforms and you'll find that Winged Sapphire. Grab the bomb that the Clam-Tron 4000 made (they respawn so don't worry it blows up too soon) and head up the stone steps to the right, throw it at the tunnel blockage. Diggs will take you to Crystal Eye Castle. I remember playing this as my last level on Christmas, playing as Zap, begging my mom for "Just a few more minutes!" I am playing with my sis using and . This really helped! Leviathan is awesome. Oh my Goud! Goud is a term used in the lazer collection 5. Look it up. LEEEEEEEEEEEEROOOOOOY-n-JENKINS! done the achievements for this lvl on xbox 360, if u need help on how to do it go onto my GB and click on the video for how to do 360 achievement on leviathan lagoon, were there are a few skylanders you-tube videos. For a 100 percent completion including the time, does the boss fight at the end included with the time given to complete the level? I was never able to find the legendary treasure but thanks to you guys I did! No, I have the wii version, it's the same. 1) i didn't need to destroy the ship to get the treasure. 2) When i left Leviathan, i didn't go to the start. 3) i was on the wii. perhaps its different on different systems? doesn't make much of a difference anyway.